Fleep, the team messaging app built and backed by a number of ex-Skype engineers, is another step further in its mission to help wean you off email. The Estonian startup, which offers apps for iOS, Android, MacOS, Windows, and the Web, is introducing what it calls ‘Fleep ID’, a username that you can hand out to contacts with whom you’d like to converse via Fleep . However, because a Fleep ID is email compatible — mine is steve@fleep.io — it can be used over time to wean yourself off email. Any messages sent to your Fleep ID, even if they are from somebody who isn’t a user of the messaging app, show up in Fleep, threaded and sorted by participants and with all of Fleep’s other features in tact. These include the ability to add additional participants to a conversation (including non-Fleep users via email), pin a message to your to-do list, see if a message has been read, and access your ‘file draw’, a single place that surfaces file attachments relating to a conversation. However, in a sense, to conquer email you must first become email. 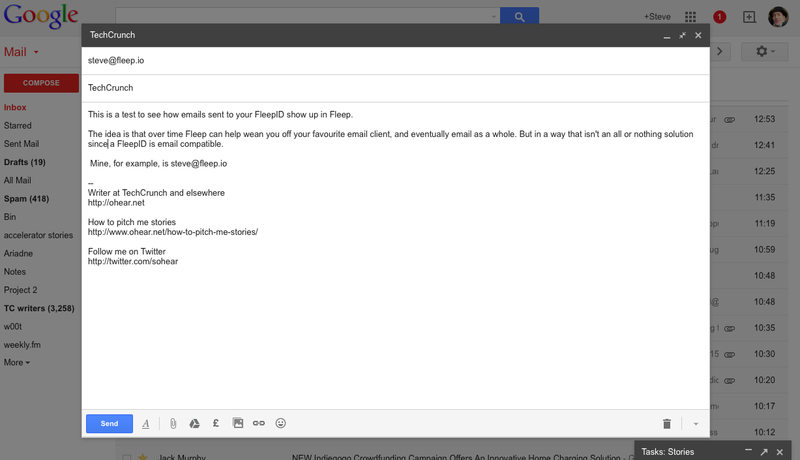 Hence the way a FleepID is, to those outside the app, an email address like any other. See the two screen shots below.